What Happens To Spelling Bee Kids? Years Later, The Prize Is Perspective NPR tracked down former top spellers to see how they're faring, decades after their early successes. Karla Miller competed in the national bees of 1984, 1985 and 1986. Her best finish was 31st, when she went out on the word "dashiki." Today, Miller is a writer and editor. At right, a recent snapshot of Miller and her daughter. For an academic contest pitting young spellers against the dictionary, the Scripps National Spelling Bee has taken on the intensity of the fiercest athletic events. Feeling the warmth of television lights — not to mention nerves and distractions — all while sports commentators are analyzing your "style" and approach is something only a select club of young word-nerdy Americans gets to experience. How does that early experience affect these mostly middle-school-aged kids later in life? 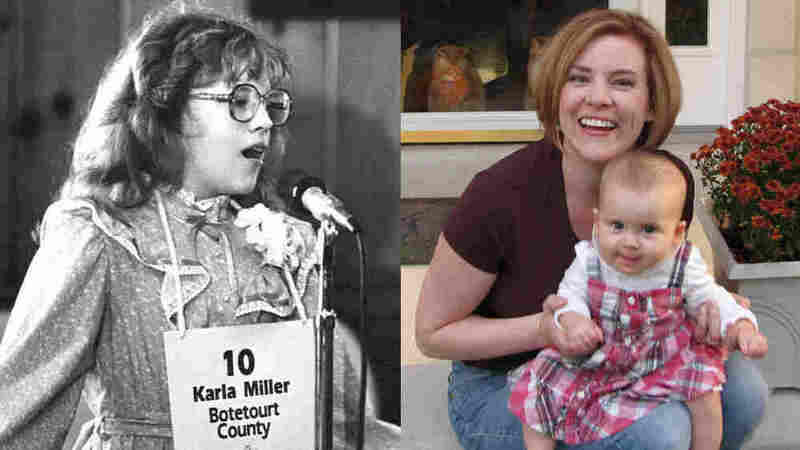 The pressure of having to spell onstage before other competitors, nervous parents and a wider audience during those awkward formative years still sends a chill up the spine of Karla Miller, who competed in the national bees of 1984, 1985 and 1986. Her best finish was 31st, when she went out on the word "dashiki." "It was a very intense experience. I had never been through something like that," Miller says. "You're on a stage in front of people, and now you're on TV and the Twitterati, and all these people watching you, waiting for you to make a mistake." Even today, Miller gets too anxious to watch the bee on television. She says she'll never forget the sound of getting a word wrong: the "ding" of a bell. "I can't handle it," she says. "When I see it on the news, I see the clips and have to turn away because it stresses me out too much." It's been nearly 30 years since Miller's first bee, and the stakes have only gotten higher. Cash and prizes total more than $60,000. ESPN is broadcasting not just the final rounds but the semifinals on its ESPN 2 and ESPN 3 channels. She has a little residual spelling stress, but Miller, who today is a writer and editor, says on balance, her early experiences were positive. They helped her with confidence, poise and putting her on track to a career involving language. Former spellers tend to lead successful professional lives, says James Maguire, who tracked years of national spellers for his book, American Bee: The National Spelling Bee and the Culture of Word Nerds. "Whatever the menu of things they're going to do, that skill of single-minded focus is going to help them. Not only can they do that — they can do it under pressure." Maguire says almost all the former spelling bee kids wind up winning "at life," though not necessarily with careers working with words. More than half a dozen former champs from the past two decades excelled in math and science and went on to become physicians. 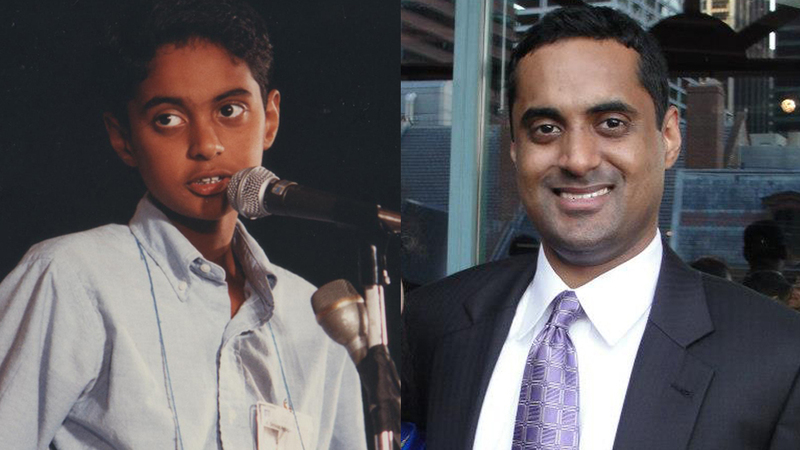 Srinivas Ayyagari, 32, was 14 years old when he finished third — for the second time — in the national bee of 1994. That was the first year ESPN covered it. Srinivas Ayyagari onstage in 1992 (left); at right, Ayyagari today. "Seeing someone from ESPN commenting on your style and strategy was bizarre and weird. But it's the closest I'll ever come to being an athlete," Ayyagari says. "The lights were incredibly bright and that sort of changed the dynamic about it," Ayyagari says. "Seeing someone from ESPN commenting on your style and strategy was bizarre and weird. But it's the closest I'll ever come to being an athlete." Not content to stop with just one brainy pursuit, Ayyagari went on to Harvard for college, Penn for law school and Jeopardy! for a $27,400 win. "This will be a better highlight for you," Alex Trebek told Ayyagari after he won. Other former spelling champs have also gone on to conquer quiz games and shows. Ned Andrews, the 1994 champ who wrote a book of spelling bee advice called The Champion's Guide to Success in Spelling Bees, still loves a mental challenge. When NPR contacted him to discuss his bee experience, he revealed he's "a longtime regular entrant" in the Weekend Edition Sunday puzzle. "Big surprise, I know," he writes. Today, Ayyagari is searching for full-time work in Washington, D.C. It's one of the most competitive markets for lawyers, but because of his early experiences, he says he's used to tough competition. "Being a lawyer elsewhere could be a smoother experience, but there's something there that got lit at a very young age about pushing myself against the best and feeling like I had a reason to do that," Ayyagari says. Two decades since his peak spelling years, Ayyagari says he's proud of the effort he put into his early successes. "There are going to be factors that you can't account for," he says. "Whether it's words you don't know or something else. You have to just try your best and the factors you can't account for are something you're going to have to face as best you can. That effort is something that I will always stand behind." 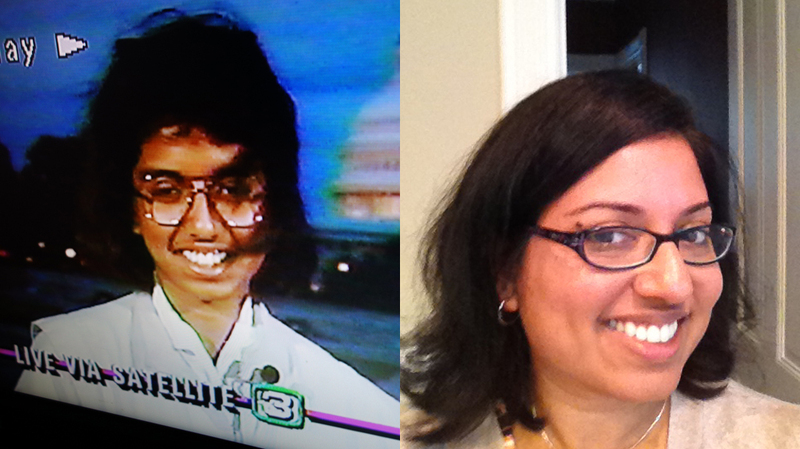 (Left) 1988 champion Raga Ramachandran gives a TV interview at age 13. Today, Ramachandran is a surgical pathologist at the University of California, San Francisco. 1988 champion Raga Ramachandran told a television interviewer after she won at age 13 that "whatever I do, I want to be the foremost in it." Her teenage prediction was spot-on. Today, she's a surgical pathologist at the University of California, San Francisco. She remembers every detail of her spelling bee victory for correctly spelling the word "elegiacal." But 25 years later, the champ says her day-to-day life isn't different because of her big win. "I think some potential spellers and their families may have this idea that winning the national spelling bee is an automatic passport to success, and I really don't think that's true," said Ramachandran. In spelling and in life, "I know a lot of it is luck of the draw. ... If I had gotten a different word, if I had been spelling in a slightly different order, I might very well not have won." "There are probably 30 or 40 kids who go to bee who have a very realistic chance of winning and I think for them, it really is heartbreaking to not win," Maguire says. "But for all of them to go there and to compete is a good experience, it's a character-building experience." Regardless of where they placed, the former spellers say they came away with performance poise, an appreciation of hard work and a love of language. Miller is still working with words today — writing the weekly work advice column for The Washington Post Magazine. And every so often, she's reminded of her days as a competitive speller. "To this day when I hear that bell I get that frisson — that little shiver. When I hear that bell I'm thinking, oh no, I failed at something. And then I realize, no, somebody's order has come up." Decades later, they've each won a valuable prize — perspective.